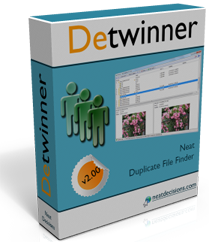 Detwinner 2.03 is the most powerful tool to find and remove duplicate files on your PC. De-dupe your files in a blink of an eye. Identify duplicate files by their content rather than name. Constrain your search by file type, size and modified date. Save your preferences once and use them as presets. Use the unbelievable flexible selection tool to mark found duplicates for deletion. 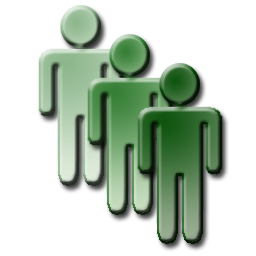 Rely on automated feature of smart selection or select files manually and precisely. Regular expression selection is included. Decide by yourself what to do with the unneeded duplicates. Delete them permanently. Or to Recycle Bin. Or to your backup folder. And preview before deleting. Run Detwinner on Windows XP SP2, Windows Vista, Windows 7. Windows Server 2003 and Windows server 2008. Both 32 and 64 bit. Make a portable installation of Detwinner on your flash drive to have excellent duplicate file eliminator always on hand. Free trial allows searching among up do 1000 files per time. Purchase incredibly cheap license to remove this restriction and obtain free support, free minor upgrades and discounts for major ones. New! Find similar images on your PC in the same manner as you search exact duplicates with Detwinner. Award winning duplicate file finder and remover for Windows. Learn more or Download it right now to check everything by yourself. 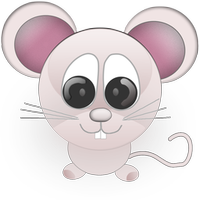 NeatMouse 1.05 is the lightweight and simple utility that allows controlling your mouse with keyboard. Great solution for dealing with discharged wireless mouse. Make precise moves with up-to-pixel accuracy. Detwinner Linux Edition is the lightweight yet powerful tool for GNOME desktop environment which finds and removes exact file duplicates and similar images. Search for exact duplicates or similar images. Regular expressions for a precise search. Smart selection options to simplify the cleanup. Designed in the spirit of GNOME 3 desktop. Available for Fedora 28, Ubuntu 18.04 and as a Flatpak bundle.